You are here: Home / Ann Coulter / Did an ‘A-List Dallas’ Actor Taylor Garrett Fake an Attack Against Him by ‘Anti-Republican’ Gays? Did an ‘A-List Dallas’ Actor Taylor Garrett Fake an Attack Against Him by ‘Anti-Republican’ Gays? 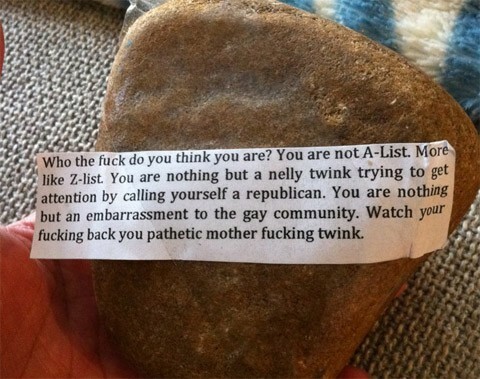 Late last week, Taylor Garrett, a reality show participant in LOGO's A-List: Dallas, tweeted a photo of a rock with a note on it and claimed that he was the victim of an anti-GOP attack by someone defending the gay community. The tweet, since deleted, came following LOGO's decision to feature Republican pundit Ann Coulter in a guest spot on the show. Blogger Joe Jervis wasn't convinced that Garrett's tweet and claim passed the smell test and noted that LOGO executive producer John Hill shortly thereafter tweeted congratulations to Garrett for "making headlines" with his claim. When I questioned Hill as to whether he'd played a role in the stunt, his tweet to Garrett was instantly deleted. Neither Hill nor Logo have yet responded to my questions. I understand all too well that gay people are not above the depths of scumbaggery typically associated with producing reality television, but a false hate crime claim is truly beyond the pale. At the very least, Logo and the show's producers should address what some are (hopefully wrongly) thinking. As you may recall, GOProud's LaSalvia claimed to be the victim of an anti-gay hate crime last July, though his claims lost much of their credibility when he began using them to push GOProud's pro-gun, anti-LGBT hate crime legislation agenda. An online petition objecting to LOGO's decision to give airtime to Coulter has 1,168 signatures as of this posting.